This Modern Futon / Sofa bed is superbly detailed in a soft and luxurious red finish Micro fiber fabric, constructed with solid wood frame. It is perfect and comfortable in any room of the house and very convenient for your guests, friends or relative sleepovers. This item is brand new in factory box. Simply assembly required. 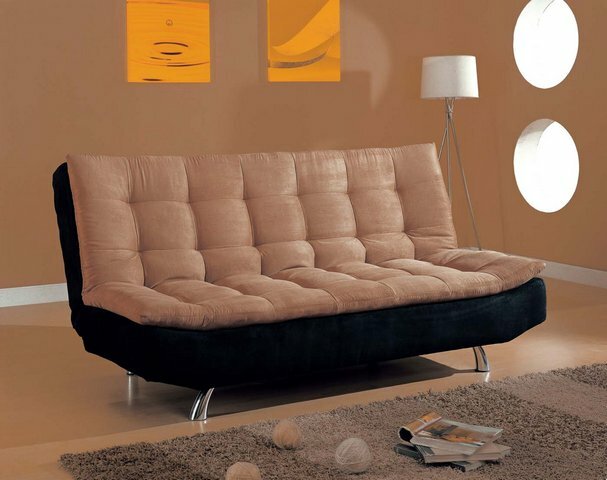 This listing is only for the sofa Futon bed. Other items and decorations are not included. This item is brand new in original factory boxes. Simple assembly required. We only choose those quality products we trust to sell on Ebay. Most of them carried manufacturer's warranties. We, as a retailer, do not carry any additional warranty. We accept Visa, MasterCard, Discover Card and American Express through PayPal or through phone. We also accept Cashier's check or money order. Payments must be received within 3 days. You need provide your telephone number (required by shipping company) while paying, otherwise shipment will be delayed. Your order will be shipped out of our facility mostly within 3 working days after receipt of the payment and your phone number! S & H for this item is $155 within the 48 contiguous states. We do not charge sales tax, EXCEPT merchandise shipped to California addresses must pay 8.25% sales tax. Optional Shipping Insurance: $10 Shipped to your PayPal address. Please make sure it is correct! Shipping and handling fees and shipping insurance: Costs will be paid by the buyer, and will be added to the invoice during checkout. All shipping and handling fees quoted are based on standard flat rate shipping. Shipping insurance is required. Shipping time: The item normally leaves our facility within five working days after received your payment. Allow 2-4 weeks for delivery to reach your home or office. Please keep in mind large item takes longer time to arrive.